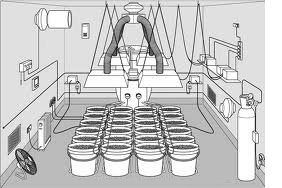 Do you have any plans on how to set up a 6 x 8 hydroponic growroom area, for example where the lights should go, fans, etc. etc. Thanks very much! Answer: Terry- One of the most standard size garden areas I deal with all the time is 4 x 8 feet. An area this size is best lit by two 600 watt HPS lights, with one placed in the center of each 4 x 4 foot area of the garden. Another option would be to light the area with one 1000 watt light on a short (18-20 inch) light mover. Unfortunately, lighting a garden area this size cannot be done well with just one light if it is not on a light mover. These kind of lights should be kept about 18 inches above the tops of your plants, although you may be able to get a little closer if the lights are cooled (usually done with another exhaust fan). Air circulation around the plants is just as important as air exhaust/air intake. A 12 inch oscillating fan on a 3 foot or 4 foot stand is perfect for a garden area this size. Placing the fan along one of the "long" sides of the garden works well if you can. The other three walls should be painted flat white to reflect light back into the garden (unless you plan on hanging mylar or white plastic). The top of the fan should be even with the top of your plants, so that the air will circulate through the bulk of the vegetation. 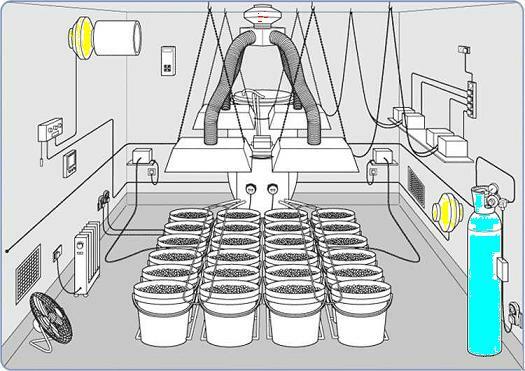 If you have an exhaust fan on your lights, make sure to exhaust it outside the grow room. Even then you will find it necessary to have an additional exhaust fan for the room itself, and possibly even a fan for air intake (especially useful when growing indoors during cool/cold months). Usually, you will want the exhaust fan to be positioned high in the room, to exhaust the warmest air from the room. The air intake should be positioned low in the room (below the vegetation would be ideal). This creates an air flow from the bottom of the garden area to the top (across the vegetation in your garden). Your air intake needs to come from a source of cool, fresh air. This air will be used for temperature control in the garden, as well as to replenish the CO2 levels in the garden area (which will fall very quickly without this air exchange). If your air intake is made to draw air directly from outside, you need to pay close attention to the temperature in your garden- during cold months the air intake could actually make the garden area too cold (especially during lights off). If you have your hydroponic system up on saw horses, you can probably slide your nutrient reservoir underneath your system (as well as a few other things, like your nutrients). This will leave you just enough room in the 6 x 8 foot area to enter the garden to do things (like stare at your beautiful plants and what not). Controlling the temperature in the garden area, both during the light cycle as well as during the dark cycle, is one key to a successful garden. I recommend getting a cheap ($25.00) digital "indoor/outdoor" thermometer that can also measure humidity (the one I use is made by Sunleaves). This device keeps track of the high and low temp until you reset it....check it every day and reset it every day, making adjustments to your setup to keep the temperature right both "day" and "night". This goes for humidity also, though it is generally not a problem until the last few weeks of the flowering period. Place the "outdoor" probe of the thermometer in your garden's hot spot (in the tops of your plants, directly below one of your lights). Hang the thermometer on a wall wherever you would like to read the "indoor" temp. During "lights on", the ideal temp would be 70-75 degrees....nighttime temps are ideal when they are 10 degrees cooler than daytime temps. If the difference between daytime and nighttime temperature is greater than 15 degrees F, it will stress your plants out....try to avoid that. Follow this advice and you will have good temperature control, good air circulation, adequate lighting, and adequate air exchange (intake in, exhaust out). The only other things you need to worry about will be using an appropriate feeding plan for the type of plants you are growing, maintaining your nutrient reservoir properly according to your feeding plan, and controlling the dark period properly to force flowering when the time comes. As a very general guide, I am including the picture above (although it does not accurately represent your particular situation). I hope this helps, and Happy Growing!